The following passage from Aulus Gellius‘ The Attic Nights describes the Stoic doctrine concerning involuntary emotional reactions or “proto-passions” (propatheiai). See also Seneca’s On Anger, for a detailed discussion with some different examples, relating to anger rather than fear. The concept is also mentioned in Marcus Aurelius’ Meditations – all three of our main surviving sources for Stoicism. Grasping the role of “proto-passions”, which are accepted by Stoics as natural and indifferent, is absolutely essential to an accurate understanding of Stoicism particularly in terms of the distinction between Stoicism (capital S), the Greek philosophy, and stoicism (small s), the “stiff upper lip” personality trait. Regarding the anecdote below… It concerns a Stoic teacher who was caught at sea in a very severe storm, where the boat was clearly in danger of sinking and the crew of drowning. He turned pale and was frozen with fear, just like everyone else, but unlike the rest he wasn’t crying aloud and lamenting their situation. Unfortunately, we don’t have any indication who the famous Stoic that Aulus Gellius encountered on his sea journey may have been. He says the Stoic possessed a copy of Epictetus’ Discourses and was an important and well-respected teacher in Athens. They were apparently both sailing from Cassiopa, a town in the region of Korkyra, on Corfu, to Brundisium, in southern Italy, possibly en route to Rome. The only famous Stoic we hear much about who was teaching in Athens around the middle of the 2nd century AD is Apollonius of Chalcedon, a tutor of Marcus Aurelius – but there’s no reason to assume he’s actually the man in question. Although, from what we know about Apollonius, he was perhaps slightly haughty like the character being described in this vignette. We can rule out Arrian, incidentally, as he’s mentioned here in passing, and doesn’t seem to have taught Stoicism anyway. It’s believed the Discourses of Epictetus originally spanned eight volumes, only four of which survive today. The Stoic teacher mentioned here appears to have shown Aulus Gellius a passage from one of the volumes now lost to us, the fifth book of the Discourses. However, Aulus Gellius also remarks that the doctrine of proto-passions described by Epictetus “undoubtedly” agrees with the original Stoic teachings of Zeno and Chrysippus. (Incidentally, this could be read as implying that Epictetus was typically known for following early Greek Stoic teachings very closely.) The Attic Nights were written in Latin, so Aulus Gellius sometimes comments on the fact he is quoting from the Greek language. The proto-passions are here described as “brief but inevitable and natural”, precursors of full-blown emotions and desires. They are classed as morally indifferent by Stoics. I would add that the Stoics perhaps viewed them as comparable to the primitive feelings experienced by other animals, as a sort of reflex-like antecedent of full-blown human emotion. Aulus Gellius concludes it would be a mistake to interpret the Stoics as teaching that feeling fear for a brief time, and turning pale, is the sign of a foolish and weak person. Rather even Stoics yield to natural human (physiological) weakness in this regard but they do not continue to go along with their initial feelings by giving conscious assent to the impression and believing that events are as terrible as they seem. For instance, a Stoic who unexpectedly glimpses someone wearing a frightening mask out of the corner of his eye might be startled and automatically become tense and pale, his heart beating suddenly faster. However, if we suppose it’s just a costume, when he realizes this he will no longer go along with the initial impression that something bad is going to happen. He will no longer give assent to the idea that he’s in danger, and his feelings will naturally abate, although he may take a few minutes to regain his composure. The Stoic Sage views all external events as indifferent but he probably has to remind himself of this as his body will automatically create troubling impressions in response to certain typical threats. Rather than trying to suppress these feelings, or feeling ashamed about them, Stoics merely accept them with indifference, and shrug them off, which is a very different response to what people often mean by “stoicism” or having a stiff upper lip. The reply of a certain philosopher, when he was asked why he turned pale in a storm at sea. We were sailing from Cassiopa to Brundisium over the Ionian sea, violent, vast and storm-tossed. During almost the whole of the night which followed our first day a fierce side-wind blew, which had filled our ship with water. Then afterwards, while we were all still lamenting, and working hard at the pumps, day at last dawned. But there was no less danger and no slackening of the violence of the wind; on the contrary, more frequent whirlwinds, a black sky, masses of fog, and a kind of fearful cloud-forms, which they called typhones, or “typhoons,” seemed to hang over and threaten us, ready to overwhelm the ship. With these words then the Stoic rid himself of the rich Asiatic. But later, when we were approaching Brundisium and sea and sky were calm, I asked him what the reason for his fear was, which he had refused to reveal to the man who had improperly addressed him. And he quietly and courteously replied: “Since you are desirous of knowing, hear what our forefathers, the founders of the Stoic sect, thought about that brief but inevitable and natural fear, or rather,” said he, “read it, for if you read it, you will be the more ready to believe it and you will remember it better.” Thereupon before my eyes he drew from his little bag the fifth book of the Discourses of the philosopher Epictetus, which, as arranged by Arrian, undoubtedly agree with the writings of Zeno and Chrysippus. That these were the opinions and utterances of Epictetus the philosopher in accordance with the beliefs of the Stoics I read in that book which I have mentioned, and I thought that they ought to be recorded for this reason, that when things of the kind which I have named chance to occur, we may not think that to fear for a time and, as it were, turn white is the mark of a foolish and weak man, but in that brief but natural impulse we yield rather to human weakness than because we believe that those things are what they seem. In The Meditations, Marcus Aurelius appears to be referring to the proto-passions when he writes that although he tells troubling impressions “Go away”, because they have come according to their “ancient manner”, i.e., in the way basic feelings also arise in animals, he is not angry with the feeling, presumably meaning that he does not judge it to be an evil (7.17). In the following passage, Marcus tells himself to view rough or smooth sensations that impose themselves on his mind with detachment. He notes that unpleasant sensations are bound to impinge upon our awareness because of the natural sympathy between body and mind but we should not try to resist these natural feelings and we should refrain from calling them either good or bad. Rather we should accept the presence even of these “rough” sensations with total indifference. In passages like these Marcus appears to be referring to bodily sensations of pleasure and pain. However, he also seems to recognize that sometimes these sensations will naturally communicate themselves from the body deeper into the mind, and this too is natural and indifferent. He may be referring here to the anxious reactions we naturally have to pain and discomfort, etc., as in the anecdote from Aulus Gellius above. This article provides an overview of some of the specific verbal formulas to be found in Stoic writings, particularly those derived from Epictetus. As the examples Epictetus gives often appear to be concise verbal formulae, it’s not a great leap to compare them to modern concepts such as “coping statements” in cognitive therapy or just “verbal affirmations” in self-help literature. Translating Greek philosophical texts often leads to slightly more long-winded English. For example, Epictetus tells his students to say “You are just an impression and not at all the things you claim to represent.” Those fifteen English words translate only seven Greek words φαντασία εἶ καὶ οὐ πάντως τὸ φαινόμενον. So the original phrase taught by Epictetus is often much briefer and more laconic. There are many more verbal formulae in Epictetus and other Stoic writings but for now I’ve just collected together some of the key passages where he specifically uses the verb epilegein. Epictetus, and other Stoics, very often use this financial metaphor. We should view life as a series of transactions, where we’re being asked to exchange our inner state for externals. We might obtain great wealth, but pay the price of sacrificing our integrity or peace of mind. The New Testament says “What shall it profit a man if he gains the whole world but loses his soul”. That could easily have been said by a Stoic philosopher and it beautifully captures what they mean. On the other hand, if you choose to value virtue above any externals, you might remind yourself of this by saying that sometimes sacrificing wealth or reputation, or accepting their loss without complaint, is the price you’re willing to pay for retaining your equanimity. There’s some wordplay here lost in translation because the Greek word for an impediment or obstacle literally means that something is “at your feet”, and here Epictetus uses it to refer to something actually impeding our leg from moving. It’s tricky to capture the scope of prohairesis in English, and it’s usually translated as something like “will”, “volition” or “moral choice” – it means something between what we would call volition and choice. This is also tricky to translate but mainly because it condenses a great deal of Stoic philosophy in a slightly opaque way. Stoic action with a “reserve clause” involves both an external outcome that’s sought “lightly”, in a dispassionate manner, and an inner goal (wisdom/virtue) that’s prized more highly. In any activity, the Stoic should remind himself that his primary goal is to come out of it with wisdom and virtue intact, or increased, and that’s infinitely more important than whether he succeeds or fails in terms of outward events. This appears to mean that impressions are just mental events and not to be confused with the external things they claim to portray. The map is not the terrain. The menu is not the meal. This abrupt phrase, ouden pros emi, occurs very many times throughout the Discourses. The Greek is strikingly concise. Quoted by Marcus in Meditations 4.49. This is a common theme in the Stoic literature. Adversity gives us the opportunity to exercise virtue, and handled well therefore every misfortune turns into good fortune, for the wise. Marcus makes it clear this is a phrase to have ready in mind, memorized, to be repeated in response to all manner of situations. He goes on to say that all I can ask for is that my present actions are rational, social, and at one with the Law of God. This sounds like “The Lord giveth and the Lord taketh away”. However, it also recalls many other comments by Marcus. There’s a famous Latin poetry trope called ubi sunt and this Stoic phrase seems to say exactly the same thing in Greek: Pou oun ekeinoi? This is a recurring theme in his writings but it’s verbal formula is perhaps stated most explicitly in this passage. In every act of another habituate yourself as far as may be to put to yourself the question: “What end has the man in view?” But begin with yourself, cross-examine yourself first (Meditations, 10.37). This is also a common theme in Marcus’ Meditations, to examine the motives of others and what they assume to be good or bad in life, as a means to forgiveness and empathy, through understanding. The Greek says very simply: ho kosmos, alloiosis. ho bios, hupolepsis. Literally: “The cosmos, change; life, opinion.” This was obviously meant to be memorized, like slogan or mnemonic. Marcus means that the external world is constantly changing and nothing lasts forever; and that the quality of our lives is determined by our judgments, mainly those about what is good or bad in life. An introduction to Stoicism, or applied Stoic philosophy, focusing on the “Three Discplines” found in the writings of Epictetus and Marcus Aurelius, as explained by the modern French scholar Pierre Hadot. From its origin Stoicism placed considerable emphasis on the division of philosophical discourse into three topics called “Ethics”, “Physics” and “Logic”. Philosophy itself was unified but theoretical discussions could be broadly distinguished in this way and the Stoics were particularly known for their threefold curriculum. Epictetus is the only Stoic teacher whose work survives in significant amounts, we have four volumes of his Discourses, recorded from his public lectures by his student Arrian, although another four volumes have apparently been lost. We also have a condensed version of his teachings compiled in the famous Stoic “Handbook” or Enchiridion. Although Epictetus lived about four centuries after Zeno, the founder of Stoicism, and by his time the formal institution of the Stoic school had apparently ceased to exist, he appears to have been particularly faithful to the early teachings of the school’s main founders: Zeno and Chrysippus. The Roman emperor Marcus Aurelius, the Stoic best-known to modern readers, was taught by philosophers who possibly studied with Epictetus, although he never met him himself. One of Marcus’ teachers gave him a copy of notes from Epictetus’ lectures, almost certainly the Discourses recorded by Arrian. Indeed, Marcus refers to the teachings of Epictetus repeatedly throughout The Meditations and it’s clear that he’s primarily influenced by this particular form of Stoicism. He also makes extensive use of the Three Disciplines described in the Discourses, which provide one of the main “keys” to interpreting his own writings. So how are we to interpret these Stoic practical disciplines? The French scholar Pierre Hadot wrote a very thorough analysis of Marcus Aurelius’ Meditations called The Inner Citadel (1998), in which he explores the Three Disciplines in detail, employing them as a framework for his exposition. If we follow Hadot’s interpretation, it actually provides a fairly clear and simple model for understanding the teachings of Stoicism. The way of Stoic philosophy was traditionally described as “living according to nature” or “living harmoniously” and Hadot suggests that all three disciplines are intended to help us live in harmony in different regards, and that they combine together to provide the secret to a serene and harmonious way of life, practical philosophy as the art of living wisely. According to Hadot, the discipline of “desire” (orexis) is the application to daily living of the Stoic theoretical topic of “physics”, which includes the Stoic study of natural philosophy, cosmology, and theology. The discipline of desire, according to this view, is the virtue of living in harmony with the Nature of the universe as a whole, or in the language of Stoic theology, with Zeus or God. This entails having a “philosophical attitude” toward a life and acceptance of our Fate as necessary and inevitable. It’s tempting to see this discipline as particularly entailing the cardinal virtues associated with self-control over the irrational passions, which are “courage”, or endurance in the face of fear and suffering, and “self-discipline” (temperance), or the ability to renounce desire and abstain from false or unhealthy pleasures. (Hence, Epictetus’ famous slogan: “endure and renounce”.) Hadot calls the goal of this discipline “amor fati” or the loving acceptance of one’s fate. This discipline is summed up in one of the most striking passages from the Enchiridion: “Seek not for events to happen as you wish but wish events to happen as they do and your life will go smoothly and serenely.” But Stoics are not “doormats”. The Stoic hero Cato of Utica famously marched the shattered remnants of the Republican army through the deserts of Africa to make a desperate last stand against the tyrant Julius Caesar, who sought to overthrow the Republic and declare himself dictator of Rome. Although he lost the civil war, he became a Roman legend and the Stoics dubbed him “the invincible Cato” because his will was completely unconquered – he tore his own guts out with his bare hands rather than submit to Caesar and be exploited by the dictator for his propaganda. Centuries later, the Stoic emperor Marcus Aurelius, despite a devastating plague and countless misfortunes beyond his control, led his weakened army repeatedly into battle to defend Rome against invading barbarian hordes. He prevailed despite the many obstacles to victory. If he’d failed, Rome would have been destroyed. As we’ll see, the discipline of action explains this strange paradox: how can the Stoics combine acceptance with such famous endurance and courageous action in the name of justice? I’ve described this discipline simply as “Stoic Acceptance”, meaning amor fati. It’s tempting to see this discipline as particularly associated with the cardinal virtue of “justice”, which the Stoics defined as including both fairness to others and benevolence. Hadot calls this discipline “action in the service of mankind”, because it involves extending the same natural affection or care that we are born feeling for our own body and physical wellbeing to include the physical and mental wellbeing of all mankind, through a process known as “appropriation” (oikeiosis) or widening the circle of our natural “self-love” to include all mankind. I’ve described this as “Stoic Philanthropy”, or love of mankind, a term they employed themselves. According to Hadot, the discipline of “assent” (sunkatathesis) is the application to daily living of the Stoic theoretical topic of “logic”. Stoic “logic” actually includes elements of what we would now call “psychology” or “epistemology”. The discipline of assent, according to this view, is the virtue of living in harmony with our own essential nature as rational beings, which means living in accord with reason and truthfulness in both our thoughts and speech. It’s tempting to see this discipline as particularly associated with the cardinal Stoic virtue of “wisdom” or truthfulness. Hadot calls the goal of this discipline the “inner citadel” because it involves continual awareness of the true self, the faculty of the mind responsible for judgement and action, where our freedom and virtue reside, the chief good in life. According to Hadot’s analysis, although the Stoics refer to “judgement” in general (hypolêpsis), they’re primarily interested in monitoring and evaluating their own implicit value-judgements. These form the basis of our actions, desires, and emotions, especially the irrational passions and vices which the Stoics sought to overcome. By continually monitoring their judgements, Stoics are to notice the early-warning signs of upsetting or unhealthy impressions and take a step back from them, withholding their “assent” or agreement, rather than being “carried away” into irrational and unhealthy passions and the vices. The Stoics call this prosochê or “attention” to the ruling faculty of the mind, to our judgements and actions. I’ve described this as “Stoic Mindfulness”, a term that can be taken to translate prosochê. As you can probably see, these three disciplines overlap considerably and are intertwined, just like the three traditional topics of Stoic philosophy, which Hadot claims they’re based upon: Logic, Ethics, and Physics. However, in unison, they allow the Stoic to work toward a harmonious and consistent way of life, in accord with nature. By this, the Stoics meant a life in the service of the natural goal of human nature, the attainment of fulfilment “eudaimonia”, the good life, achieved by perfecting moral reasoning and excelling in terms of the cardinal virtues: wisdom, justice, courage, and self-discipline. This article (part 1) explores some of the animal metaphors found in Stoic literature, particularly the analogy of the “bull and the lion”, mentioned in Tom Wolfe’s novel A Man in Full (1998). In part 2 of this article, I describe how the Stoics made a division between rational animals (humans and gods) and non-rational animals, further subdivided into wild animals, like wolves and lions, and domestic animals, like cattle and sheep. The presence of a similar metaphor in Seneca suggests that he and Epictetus, and perhaps Marcus, are alluding to a common Stoic source from an earlier period. This suggests that Zeno may have introduced the metaphor of the ideal Stoic Republic as consisting of a herd of cattle led by a bull. 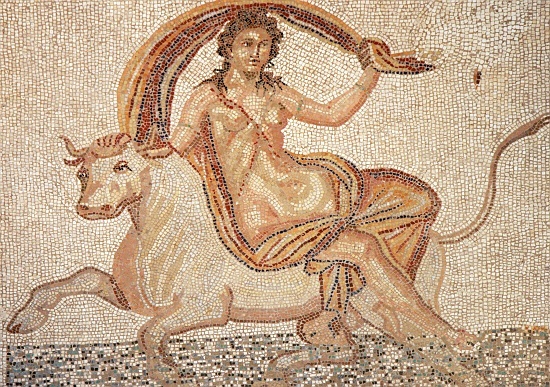 Indeed, the early Stoic school itself was a small community perhaps intended to be modelled on this ideal to some extent, so Zeno himself, or the subsequent scholarchs of the school, may have been seen as analogous to the bull in this imagery. Brief excerpt from the chapter on love and friendship in Stoicism from the forthcoming book “Teach yourself Stoicism”, due for publicaiton in 2013 by Hodder. Copyright (c) Donald Robertson 2012. All rights reserved. That, far from being completely unemotional, Stoicism can be viewed as a philosophy that emphasises the concept of love or “natural affection”. That the Stoics were apparently one of the first major Western philosophical schools to encourage women to become philosophers as well as men and that they taught both men and women how to maintain a philosophical attitude toward their family and children. That they encourage us to develop our own natural instinct for self-preservation into a more profound love of flourishing, in terms of our essential nature as rational animals, “love of wisdom” being the original meaning of the word “philosophy”. That they also encourage us to expand our natural affection for ourselves into a kind of family affection and affinity or kinship with all mankind, aspiring to be true “philanthropists”, or lovers of mankind. That Stoicism involves learning to love Nature as a whole – or God, if you’re religiously inclined – by serenely accepting events outside our control as causally determined by Nature, or fated by the Will of God. That the Stoics taught one can only truly love others, rather than being irrationally and unnaturally attached to them, by accepting the fact that everyone and everything we love is inevitably transient and subject to changes beyond our control. That, according to this view, to love others is more valuable than to be loved ourselves; and to show friendship is better than to receive it, because the strength and wisdom that resides in our own character is more intrinsically important than how other people happen to treat us. Short article outlining a basic three-step psychological and philosophical strategy described by the Stoic philosopher Epictetus for coping with misfortune or adversity. If you have these thoughts always at hand and go over them again and again in your own mind, and keep them in readiness, you will never need another person to console you, or strengthen you. Speaking to a group of aspiring Stoic students, he outlines the recommended steps to be memorised and rehearsed as follows. Step One: Tell yourself it was to be expected. Your initial response when something apparently “undesirable” happens should be to tell yourself that it was “not unexpected”, and this “will be the first thing to lighten the burden”, according to Epictetus. This is made easier by regularly anticipating potential setbacks that can happen in life, imagining what it would be like to face typical misfortunes philosophically. This is sometimes called premeditatio malorum by Stoics, or the technique of contemplating potential misfortunes in advance. In particular, the Stoics frequently remind themselves that both they and their loved ones are mortal, and bound to die one day, and that life is inevitably transient. Here Epictetus simply says, however, that when adversity comes we should greet it by reminding ourselves not to be surprised but to recognise that we knew all along that this sort of thing can potentially happen in life. Step Two: Tell yourself that it is indifferent to your wellbeing. It comes from the quarter of the things that are outside the sphere of volition, that are not my own; what, then, is it to me? The typical answer Stoics give to that rhetorical question is: “It is nothing to me.” In fact, one of Epictetus’ basic maxims is that things beyond our volition, outside of our control, are “nothing to us.” Epictetus also advised his students, perhaps literally, to say very concisely to themselves either “avolitional, not bad!” (aproaireton, ou kakon), to apparent external misfortunes, or “volitional, good!” (proairetikon, agathon), to virtuous responses, and so on. For Stoics, the ultimate good in life is to possess wisdom, justice, and other virtues, and to act according to them. The vicissitudes of fate, external events, the wheel of fortune that sometimes raises us up and at other times casts us down, is “indifferent” with regard to our own character and virtue and, in that sense, of no concern with regard to our true wellbeing as rational agents. Step Three: Remind yourself that it was determined by the whole. Were Hand Gestures a Technique of Stoicism? Short article describing the potential use of a series of symbolic hand gestures described by Zeno, as a psychological exercise or coping strategy in modern Stoicism. The early Stoics reputedly said that “knowledge is the leading part of the soul in a certain state, just as the hand in a certain state is a fist” (Sextus in Inwood & Gerson, 2008, The Stoic Reader, p. 27). This analogy between secure knowledge, having a firm grasp on an idea, and the physical act of clenching the fist seems to be a recurring theme in Stoic literature. The hand is held open, at a distance, with palm upwards, to symbolise a superficial impression or “presentation”, prior to assent being given. The hand is closed loosely, to symbolise initial “assent” or agreement with the idea. The hand is squeezed tightly into a fist to symbolise a firm grasp (katalepsis) or sense of certainty, assent has been given to it as an “Objective Representation” or phantasia kataleptike. The fist is enclosed tightly in the other hand, to symbolise the perfect “knowledge” of true ideas attained by the ideal Sage, which is elsewhere described as an interconnection of firmly-grasped principles and ideas, forming the excellent character of the wise. For the Stoics it was important to memorise the precepts and integrate them completely with one’s character in order to have them always “ready-to-hand” in the face of adversity. It’s possible that the physical act of literally clenching the fist, like a boxer, was used as a mnemonic to recall principles required in difficult situations. It could be that the Stoics used the gesture of the open hand to symbolize withholding assent from impressions, which is one of the most important techniques of Stoic psychology. Epictetus told his students that when they spot a troubling impression they should apostrophize (speak to) it as follows: “You are just an impression and not at all the thing you claim to represent.” (More literally: You are just an appearance and not entirely the thing appearing.) This is what modern psychotherapists call Cognitive Distancing and it would make sense to recall it by using an open-handed gesture as a trigger or aide memoire. It’s possible perhaps to construct a modern Stoic psychological exercise out of this symbolic set of hand gestures. First, while repeating a precept of Stoicism (“the only good is moral good”, “pain is not an evil”) the Stoic student might initially hold his hand open as if toying with the idea and then progressively close it more tightly, while imagining accepting it more deeply, until he finally clenches his fist tightly to symbolise having a firm grasp of the idea, and closes his other hand around it, to symbolise integrating it more deeply with his character, and contemplating how the Sage might hold this belief. This might be compared to the use of “autosuggestions” or rehearsing “rational coping statements” in modern psychological therapies. There may also be an additional use, in relation to false or irrational ideas as mentioned above. A modern Stoic might make the open-handed gesture shown in Chrysippus’ statue when he notices an unhelpful or irrational thought occurring spontaneously, and entertain it a while longer, as if holding it loosely in an open hand, at a distance, while repeating “This is just an automatic thought, and not at all the thing it claims to represent” or “This is just a thought, not a fact”, etc. He might also begin with his hand loosely closed, if he’s already given his assent to an impression, and slowly relax his fingers, metaphorically “letting go” of attachment (assent) to the troubling impression. We don’t know whether the set of symbolic hand gestures described by Zeno was meant originally as a psychological technique of this kind. However, the quote from Marcus Aurelius above could perhaps be read, if taken very literally, as a description of an actual physical practice employed by Stoic students: clenching their fists to arm themselves, like a boxer, with their philosophical precepts (dogmata) in the face of adversity. Author Donald RobertsonPosted on October 10, 2012 January 29, 2018 Categories StoicismTags Epictetus, marcus aurelius, Stoic, Stoicism3 Comments on Were Hand Gestures a Technique of Stoicism?